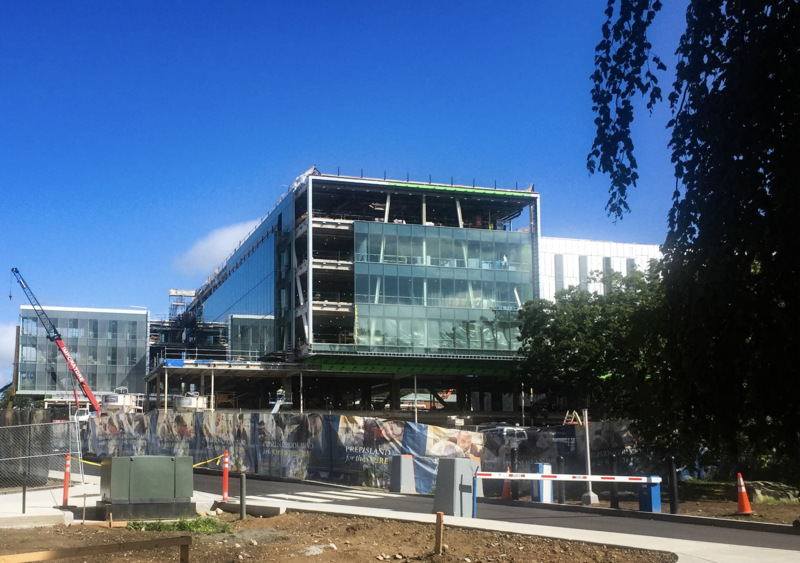 Photo by Harry Schlenger | The new engineering complex will be home to four of the five engineering disciplines including chemical, industrial, electrical, and mechanical engineering. Engineering students at the University of Rhode Island can be assured that the new, $125 million complex will be completed and ready for use at the beginning of the fall 2019 semester. The complex is the largest and most expensive construction project in URI’s history. 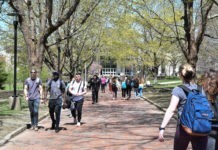 It will also include a $25 million remodel of Bliss Hall, the civil engineering building, which will be completed for the 2020 spring semester. 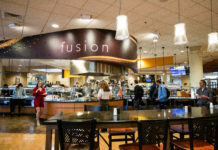 Features of the complex include a grab-and-go option run by Dining Services, a 160-foot long skywalk, new classrooms, study areas and lecture halls. There are currently seven engineering buildings, and the new development will replace five of them. The structure will encompass the four engineering disciplines: chemical engineering, electrical engineering, industrial engineering and mechanical engineering. Bliss Hall will remain as the civil engineering building within the complex. “Collaborative learning, just like collaborative engineering, has been a hallmark of the project,” Paul Depace, director of Capital Projects said. With the addition of a dining option, study spaces and the combination of the engineering disciplines, students will be able to work and discuss together within the same building. Freshmen engineering students, Mischa Deruijter, Samantha Silver and Max Bublitz cited the new engineering building as a “big draw” to the University of Rhode Island. All three freshman are ecstatic that in the fall of 2019, they will be able to take classes, study and work in a completely new and modern complex. Leal hopes that the incoming engineering students will appreciate having one central place to go to for resources, questions and answers. However, she does not presume that not having the new complex during her years at URI was “detrimental” to her learning experience. DePace, along with the company Ballinger Architects and the design and construction teams took a different approach to this enormous project. The approach is known as construction management at risk, which means that they built the building’s foundation before the design process was complete. “The design is being refined and we’re building it at the same time,” DePace said. While it made the process more difficult and required video communication with Ballinger Architects on an almost daily basis, it also meant that both the complex and Bliss Hall will be able to be completed about a year and a half earlier than they would have had they used a different, more classic approach. Once this project is complete, Capital Projects is looking at renovating more buildings across URI’s campus. “Every 20 years or so you need to tune up the building so it’s bright and modern and serves the academic program at that particular time,” DePace said, which was a reason that the new engineering complex was endorsed.